Cyclists frequently head for the loftiest pass, but Jim Malusa headed the other way: to the lowest point on six continents. The resulting adventures are the sort imagined by every cyclotourist - even if they wouldn't dare try it on their own. With a hard-core touring bike and a cold beer tucked inside his sleeping bag, Malusa embarked on a six-year series of "anti-expeditions" to the "anti-summits." His first trip took him to Lake Eyre in the arid heart of Australia. Next he followed Moses' route from the valley of the Nile to the Jordanian shore of the Dead Sea, and then raced against winter through Russian farmlands, from Moscow to the Caspian Sea. Later journeys found him battling the winds of Patagonia while pedaling across the Andes to Salina Grande, taking a chance in tiny Djibouti to reach Lac Assal in the Horn of Africa, and finally riding from his Tucson home to Death Valley. 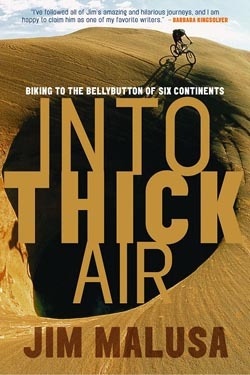 With freewheeling prose and a 'simple rolling happiness,' Into Thick Air brings to life the rewards of cyclotouring.